Samsung, the Korean tech major will be hosting a launch event next week wherein the company is expected to introduce new smartphones under the Galaxy A-Series. 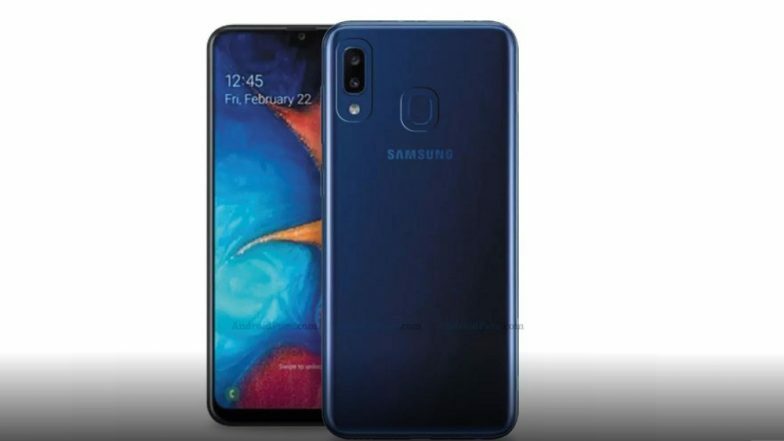 As per the market reports, the smartphone maker is expected to launch the new Galaxy A20e phone at the event which could be a toned down version of Galaxy A20. We have seen handset's images surfacing online that revealed exactly how the phone would look like. Now a new render image has surfaced online that gives a fair bit of idea about the design. Courtesty of AndroidPure, the image hints that the new Galaxy A20e phone will sport similar design as that of Galaxy A20. Samsung Galaxy Fold's New Folding Test Video Showcases Screen Durability; Watch Video. The new Galaxy A20e reportedly will carry waterdrop notch upfront, vertically aligned dual rear camera with LED flash. There will also be a fingerprint sensor along with Samsung bagding at the rear that will be placed below the camera system. Though Galaxy A20 sports glass and plastic body, the upcoming Galaxy A20e will be seen with plastic body only. As per the market reports, the device recently received Wi-Fi Alliance and Bluetooth SIG certification, which confirmed that the phone will sport Bluetooth v 5.0. The new handset from Samsung will run the latest version Android 9 Pie based on Samsung One UI. Samsung Galaxy A70 Smartphone With 6.7-inch Infinity-U Display & Triple Rear Camera Announced; To Be Unveiled on April 10, 2019. On the specification front, the new Galaxy A20e will feature a 6.4-inch HD+ Super AMOLED display screen and will be powered by in-house developed Exynos 7884 SoC. The chipset will be mated to 3GB of RAM & 32GB of internal space. In terms of optics, there will be a dual-rear camera setup at the back comprising of 13MP primary shooter and 5MP secondary sensor. The front camera could be an 8MP lens for selfies and video calling. The phone will be backed by a 4000 mAh battery.